Fifty years ago, when my husband graduated from seminary, we served for a short time in a small rural church. I was just becoming aware of the Titus 2 mandate for older women to teach younger women, but it made no sense to me because it seemed to me there was a division between the older and younger women in the church. From my twenty-five-year-old perspective, I concluded the older women were resentful of the younger women because they were fearful of losing control. I now realize I was the one who was fearful—of the older women. That little church was a part of a denomination that was increasingly questioning the authority of God’s Word. Looking back, I wonder if those women understood the power and the joy of the gospel of grace. Did they understand the sweetness of being a part of God’s family, where there are no generation gaps because of our union with Christ? I now realize I did not yet have the deep assurance of these gospel truths. We cannot overstate the importance of Paul’s instruction to Titus to teach sound doctrine. As for you, teach what accords with sound doctrine . . . Older women are to be reverent in behavior, not slanderers or slaves to much wine. They are to teach what is good, and so train the young women . . . (Titus 2:1–4). We're products of our theology, whether it's sound or unsound. What we believe or don't believe about God shows up every day in every relationship and situation. Half a century from that first church experience, I’m now an older woman. 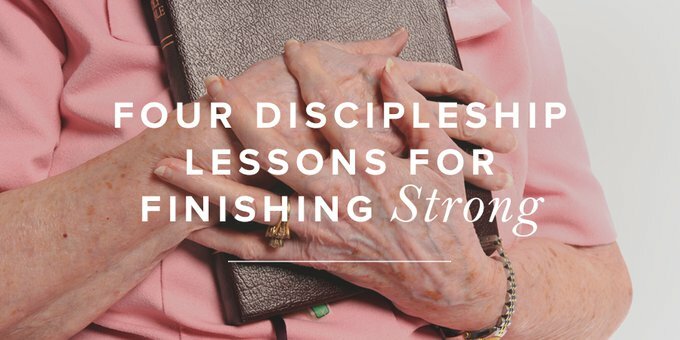 So let me share four things I wish I had known about discipleship when I was that young pastor’s wife. 1. I’m on planet Earth to put God’s glory on display. There are many things I cannot do because of my age. I don’t move as fast. I don’t think as fast. But my age does not keep me from fulfilling my purpose to glorify and to enjoy God (for the record, the only thing that hinders my reflection of God's glory is my self-centered sin). So, right here, right now, whatever our age or situation, whether we're speaking on a stage or confined to a bed, let's show up and shine His glory as we adorn the character of Christ. 2. I don’t have to be able to solve all of a young woman’s problems to encourage and equip her to live for God’s glory. In our late forties, my husband went on staff of a church with godly older women who had been taught sound doctrine. They loved and cheered for the younger women in the church. Because of them, I began to feel safe with older women, and Titus 2 came alive for me. Evelyn looked at me with compelling love and tenderness, and said, “As I listened to you, I kept thinking of one thing: ‘Jesus loves me, this I know, for the Bible tells me so.’” That, sister-friends, is sound doctrine. Her words helped me see beyond the clutter to God’s sovereign love for me. Evelyn did not criticize me. She did not give me solutions. She pointed me to the love of Jesus and the authority of His Word. She did not minimize my story by telling me her story, but I knew her story and it gave tremendous weight to her words. Her mother died when she was four years old. Her daddy moved in with his mother who cared for Evelyn and her three siblings, including her brother Ralph who was mentally challenged. Before the grandmother died, she told Evelyn, “Take care of Ralph.” Evelyn's husband died when she was 63. She never had children, but she took care of Ralph and she had a host of spiritual children. Until she was bedridden in her mid-nineties, she always showed up for church, and she was always so joyful and looked so pretty. 3. Living out the beauty of the gospel together is not just a clever tagline; it’s a gospel imperative. The Titus 2 mandate is given to the church. The local church is where we can know each other’s stories. It’s where we hear sound doctrine, so we learn how to rejoice with those who rejoice and weep with those who weep. Church is the place where are knit together in love and make disciples. Evelyn lived to be 100 years old, and until her death, she discipled me from her bed in an assisted living home, not by her words—the time came when she could no longer speak—but by her sweet submission to God’s Word and His purpose for her on this earth. 4. Young women (and all of us are younger than someone) have a responsibility to reach out to older women. Circle back to those older women in that first church my husband pastored. How would that experience have been different if I had reached out to them? What if I had taken time to get to know their stories? What if I had asked about the history of their church and community? What if I had invited groups of older and younger women into our home and asked the older women to tell us things that they had learned about the Lord that they wished they had known at our age? What if I had asked the older and younger women to share their prayer requests with each other and to pray for one another? In my arrogant immaturity, I robbed myself and delayed my growth in grace. I did not have a teachable spirit. But as always, our faithful God makes all things work together for our good and His glory. I don’t get a do-over with those women, but the Lord used my failure in that experience to make me passionate to encourage and equip older and younger women to live out the beauty of the gospel together. My sisters, wherever you are on life’s timeline, begin now to pray for grace to finish strong. The older I get, the more I understand that finishing strong means finishing weak. The Lord said in 2 Corinthians, “My power is made perfect in weakness” (12:9). May our response be that of Paul, “Therefore I will boast all the more gladly of my weaknesses, so that the power of Christ may rest upon me. . . . For when I am weak, then I am strong” (vv. 9–10). This verse is precious and personal to me. I knew it intellectually, but a few years ago, I had a sudden and severe attack of vertigo that was eventually diagnosed as a virus in my inner ear. It left me deaf in one ear and with very poor balance, so my body has to work hard to compensate, causing chronic weakness and fatigue. Through this, I have learned the power of God in my weakness, but the truth is, I was always weak. Before the episode of vertigo, I knew I should depend on the Lord, and I thought I did, but in reality, I also relied on my own strength. Listen to me . . . [you] who have been borne by me from before your birth, carried from the womb; even to your old age I am he, and to gray hairs I will carry you. I have made, and I will bear; I will carry and will save (Isa. 46:3–5). How does it feel to be an old lady? It feels like a tired, very dependent, very happy little girl being carried in the arms of her Father, and she’s calling to her friends, “Look how good and strong my Daddy is!” And she knows that when she falls asleep in His arms, she’ll wake up at home. Next Post Older Woman, Stand Up and Be a Dorcas!